A quick and easy to cook dish that will satisfy your cravings. Ingredients are not hard to find. You only need to pan fry the tanigue steaks (Spanish mackerel steaks) and put some butter sauce and presto! 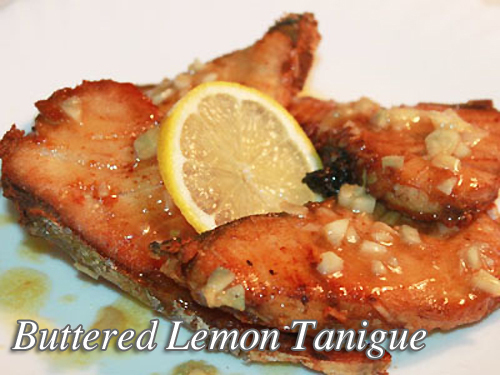 You already have a buttered lemon tanigue dish. To cook this dish; In a pan stir-fry garlic with cooking oil until fragrant. Then place the 1/2 cup butter in the pan and allow to melt in moderate heat stirring occasionally. Pour the melted sauce in a plastic container and place in the freezer to allow the sauce to solidify. Rub salt and pepper on the tanigue slices and drizzle with lemon juice let stand to marinate for at least 15 minutes. In a nonstick pan melt 1 tbsp butter and pan grill the tanigue slices one by one for 2-3 minutes each side at moderate heat or you can adjust the cooking time depending on your desired result but overcook to keep the fish moist. Place in a serving platter. Top with a scoop of semi solidified butter garlic and tanigue steak and serve. To see the rest of the recipe with the exact measurement of ingredients, continue reading. You only need to pan fry the tanigue steaks (Spanish mackerel steaks) and put some butter sauce and presto! In a pan stir-fry garlic with cooking oil until fragrant. Then place the ½ cup butter in the pan and allow to melt in moderate heat stirring occasionally. Pour the melted sauce in a plastic container and place in the freezer to allow the sauce to solidify. Rub salt and pepper on the tanigue slices and drizzle with lemon juice let stand to marinate for at least 15 minutes. In a nonstick pan melt 1 tbsp butter and pan grill the tanigue slices one by one for 2-3 minutes each side at moderate heat or you can adjust the cooking time depending on your desired result but overcook to keep the fish moist. Place in a serving platter. Top with a scoop of semi solidified butter garlic and tanigue steak and serve. Garnish with lemon slice and parsley if desired. Hi Neil, good luck on your cooking!